Unknown | Sunday, March 28, 2010 | Be the first to comment! Nearer God to thee a song sung by the titanics at their last moment of life amidst of losing life and nearer to death.How beautiful is this song if it were sung before we were struck by the great tragedies in our lives.How we can come nearer to God? We can come nearer to God by accepting Jesus Christ as our personal savior.Accepting Christ means you are nearer to God,Salvation &Blessings. Have you ever noticed that eminent and affluent people around the world was not dare enough to atleast remember God in their thoughts. They were arrogant,stiffnecked and fatheaded.As a result they are been attacked by the sudden turmoil of the life. I intend that by reading this small piece of article would enlighten you for the eternal repercussions driven to the life of blessing to accept Christ and be saved. If you think that God cannot do anything, you were wrong! You will be proved wrong! God will do any thing because he is Omniscient & Omnipotent. Dear friend as you read this article I hope you come nearer to God before the wreckage of your life. 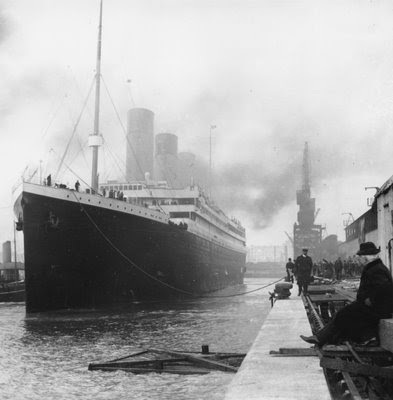 Titanic The largest passenger liner afloat, until the early morning of 15 April 1912, on its maiden transatlantic voyage, when it struck an iceberg and sank. Altogether 1, 513 died, out of a total complement of 2, 224. The ship's band famously continued playing on the sloping deck as she sank, ending its selection with ‘Nearer, my God, to thee’. The Titanic became a national symbol for both hubris and courage. British spiritualist, William T. Stead, wrote a tale similar to Futility. "How the Mail Steamer went down in the Mid Atlantic, by a survivor" appeared in the March, 1886 issue of Pall Mall Gazette. 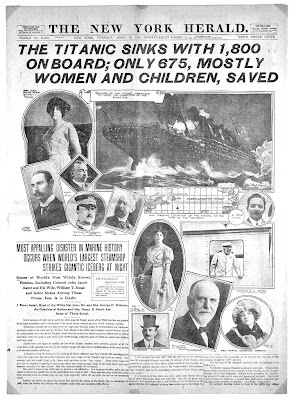 In this story, Stead tells of a large steamship that sinks after colliding with another ship. Many lives are lost due to lack of lifeboats. Stead wrote that, "This is exactly what might take place and what will take place, if the liners are sent to sea short of boats". Stead was travelling to the United States at the request of President Taft to address a peace conference at Carnegie Hall on April 20, 1912. Stead sat calmly in the library reading a book as the North Atlantic sea water came rushing in as the ship he was traveling on sank. That ship was the Titanic. Stead did not survive. William T. Stead also authored the novel From the Old World to the New. In this book, he describes the sinking of a ship in the North Atlantic after striking an iceberg. To add to the irony, the captain of the ship which picked up the survivors, was Edward J. Smith -- the eventual captain of Titanic. "Not even God himself could sink this ship". "I cannot imagine any condition which would cause a ship to founder. I cannot conceive of any vital disaster happening to this vessel. Modern ship building has gone beyond that". "When anyone asks how I can best describe my experience in nearly 40 years at sea, I merely say, uneventful. Of course there have been winter gales, and storms and fog the like, but in all my experience, I have never been in any accident of any sort worth speaking about. ...... I never saw a wreck and never have been wrecked, nor was I ever in any predicament that threatened to end in disaster of any sort". 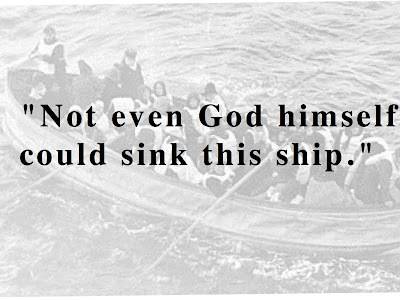 "To say a ship was unsinkable was flying in the face of God". Bible speaks about untimely death! forwhatsoever a man sow, that shall he also reap. Some years before, during his interview withan American Magazine, he said:‘Christianity will end, it will disappear. Ido not have to argue about that. I am certain. Jesus was OK, but his subjects were too simple, today we are more famous than Him’ (1966). Lennon, aftersaying that the Beatles were more famous than Jesus Christ, was shot six times. During thePresidential campaign, he said if he got 500,000 votes from his party, not evenGod would remove him from Presidency. Sure he got the votes, but he got sicka day before being made President, then he died. During A show in Canecio ( Rio de Janeiro ), while smoking his cigarette, hepuffed out some smoke into the air and said:’God, that’s for you.’ He died at the age of 32 of LUNG CANCER in a horrible manner. The ex-vocalist of the AC/DC. On one of his 1979 songs he sang: ‘Don’t stop me; I’m going down all the way, down the highway to hell’. On the 19th of February 1980, Bon Scott was found dead, hehad been choked by his own vomit. Bible (Word of God) was the worst book ever written. In June 2006 she was found burnt beyond recognition in her motor vehicle. that was given so much authority as the name of Jesus. Many have died, but only Jesus died and rose again, and he is still alive. Many people around the world are talking about the Titanic. They have either seen the movie, or television and newspaper reviews about the movie and the ship. As fascinated as everyone is, however, it seems that nobody has learned the important lesson it teaches. And it does contain a titanic lesson and great symbolism. The Titanic was the greatest ocean liner ever built at that time. It was called the “ship of dreams.” But on its maiden voyage the passengers’ dreams became their blackest nightmares. The reason why is where people should be focusing. The Titanic was the largest single moving object in 1912, weighing 46,000 tons. It was built mostly to serve the wealthy. There was a “millionaire’s suite” and fabulous furniture and decor. 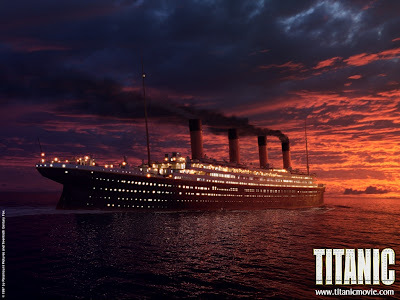 Many said the Titanic was “unsinkable.” It had been remarked by others that “even God couldn’t sink the Titanic.” These comments reveal an arrogant, God-defying attitude that led to the dramatic disaster. There were 2200 passengers on board and 1500 of them died. Captain Edward J. Smith was warned repeatedly about ice fields. He ignored them and went to bed two hours before the fatal collision. It’s easy to ignore warnings. Millions—even billions—are doing it today. But we can’t ignore the icebergs! After they struck the iceberg, it only took two hours and 40 minutes for the ship to sink. There is some very graphic film footage of the wrecked Titanic. It is two-and-a-half miles below the ocean surface. It really did sink! And 1500 people really did die. So much for God-defying arrogance! I’ll tell you what haunts me when I see video footage of the Titanic today. It is very emotional. I see Britain and America is in a similar condition—if they fail to heed God’s warning message. Our nations are headed for a disaster that will make people forget the Titanic tragedy, perhaps forever. God is sending out the “ice field” warnings. But it is “a voice crying in the wilderness” (Isa. 40:1-10). That doesn’t mean the voice is out on a barren desert. But for most people it might as well be. The voice is ignored or ridiculed by most people. They somehow think America and Britain are “unsinkable.” Like the captain of the Titanic, they ignore the warnings. They continue steaming ahead into the darkness. God and His watchman see the iceberg hidden in the black, dark night—and warn and warn and warn. But it continues to be a voice crying in the wilderness. After they strike the “iceberg,” then they will know that God’s watchman was in their midst (Ezek. 33:33). But then it is too late, physically. Even if they don’t heed the message today, there is still great hope. God is calling out His very elect now. They are being trained to be captains to direct the ship of state—in the wonderful World Tomorrow. It will be a world of dreams that are fulfilled more than people can even imagine. They will be warned about the deadly icebergs and the people will heed the warning. Their dreams will be filled to the full and running over! The greatest rewards ever to be given throughout eternity are being qualified for now. A small group is becoming God’s very elite because they hear God’s voice crying in the wilderness today. They get the glorious opportunity to be the one and only bride of Christ forever. There will never, ever be such a reward offered again. This is the most titanic dream of all! AMEN! Do you Like this message..? Sreedhar Jeshurun is a Pastor-Teacher, Translator, dynamic spiritual-writer, Cyber-blogger and a Fitness-Trainer.He loves to blog on Spirituality, Prophecies and History.His one purpose in life is to help people find a personal relationship with God, which he believes comes through knowing Christ -(Billy Graham).We Hope KING of Jeshurun is a tremendous blessing to have relationship with Jesus Christ.Please do leave your prayer requests, comments and do remember KING of Jeshurun in your prayers! Kingdom Blessings!! !